Short video showing my recent test of the Sonuus G2M Pitch to MIDI converter. For a little over $100 AU it’s a no-brainer. Already utilised on an upcoming release. This is not a paid endorsement, just me testing my new gear. In the early 80s I had the honour of working with Peter Vogel’s FAIRLIGHT company in advising and testing the world’s first Pitch to MIDI converter; the VoiceTracker (VT). The unit is quite large (approx. 30com wide) and works best with a display screen. Latency for monophonic conversion was dependent upon the internal settings, which determined how many “iterations” of the wave-cycle was analysed before deciding on the pitch, then spitting that out to 8bit MIDI. The fastest I got the unit to track with accuracy was having it set to 3 iterations, with the latency for A440 being approx. 9ms. This was very laggy by today’s standards but in 1983 it was a sensation. I’d open the show with a solo trumpet, but the audience would also hear my Yamaha DX7 synth “playing along with me.” Saxophonist Brandford Marsalis also bought one when he was in AU after I introduced the VoiceTracker to him. Unsure about his unit, but I still have mine and I’ll never get rid of it; it’s an Australian Legend in audio design and technology. 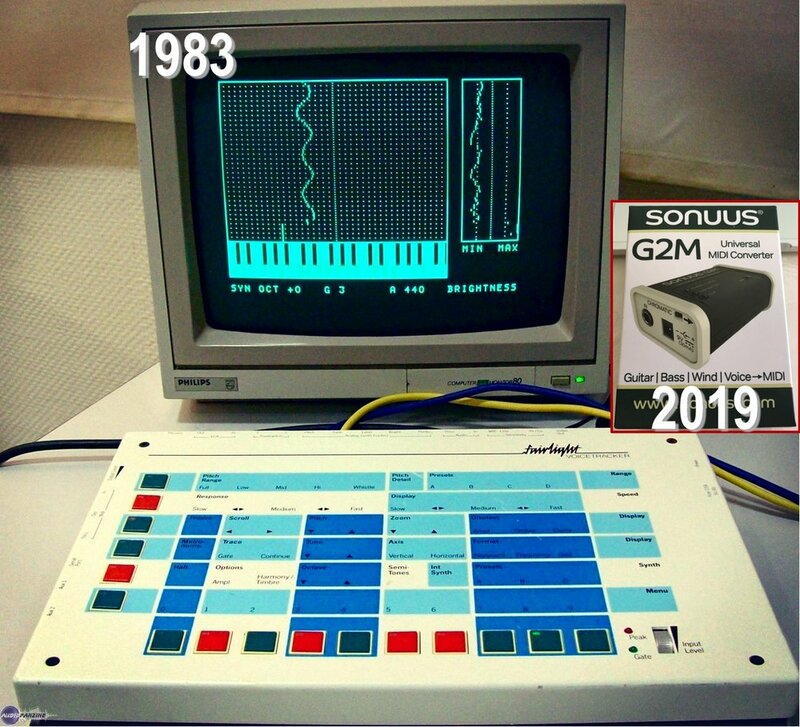 Today I bought a Sonuus G2M unit and thought readers would appreciate the differences over nearly 40 years. Oh, the price? The VT was over $3000 back then (although Fairlight did give me a good deal). The G2M was a little over $100. 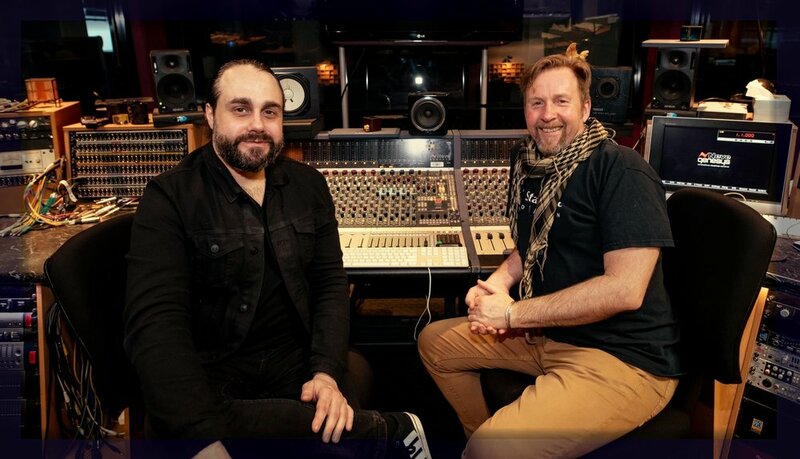 Mark Kelson and I in Studio One, featuring the 1st NEVE Genesys console in AUST. As I approach another defining chapter in my life the reflection reveals a pinnacle truth, that we as humans often opt for power rather than absolute truth. 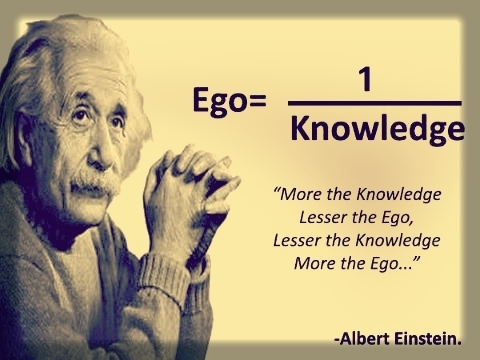 We spend so much time trying to control the world as opposed to understanding it, and more often than not the understanding is a prerequisite for somehow attaining better control. Surrendering to what we don’t know is always difficult and likely takes significantly more time than choosing to believe in something we have no proof of in order to make more sense of the world and our place in it. I am asking everyone who reads my Blog to adjust their attitudes to others who may share a different belief, imagined construct or cultural perspective. Science is not a belief or difference in world view to religion. Science does not require faith in order to exist. Please take the time to arm yourself with knowledge, for the best way to contribute to enacting upon Climate Change is to talk about it. If you're into audio engineering or are just fresh to this field of art and technical expression it's likely you've been given advice from those who may not actually have been doing this for long; I'll offer you the benefit of my forty years in studios through my eBook series. There are currently two releases published in ePub format for use on a myriad of devices: 1 investigates Recording Techniques whilst 2 delves into the workflows I've developed for Editing, predominantly in ProTools. Head over to the ToKshop to grab yourself a copy or bundle. It's been an extremely productive Summer with lot's of recording, performances, back to lectures and teaching and also managing to write the 2nd iBook (ePub format). This second publication focuses upon the Editing Techniques within the DAW environment and features a whole range of workflows for an entire production process. The intention is to provide engineers, especially junior engineers with a framework upon which to develop or adapt their own workflows in the many aspects of editing prior to the blurry end leading into the mix stage. It became apparent after releasing the 1st iBook (Recording Techniques) that whilst there are quite a few publications of that type the Editing aspects for the engineer have not been the focus for many teaching or learning resources. It is my sincere hope that this 2nd ePub document will become a valuable addition to reading the user manual for ProTools especially, although many of the workflows can be easily adapted across alternative DAW packages. Head over to the ToKshop to grab yourself a copy. Today marks the beginning of another year in teaching Audio Engineering and it's related sub-fields. This is the part I love; disseminating as much of my knowledge that I can whilst embracing everything I am still yet to learn. So teaching is always a two-way street; I learn from my students who learn from me. I began teaching in this field part-time in 2003, went full-time in 2006 and was finally offered tenure in 2007, which meant I wasn't effectively "unemployed" from New Year's Eve 'til New Year's Day. So over a decade now and the actual teaching element is still as exciting for me as ever. I am very grateful to have such a fulfilling job that serves to feed my children and I but above all that I am blessed that my students actually enjoy my teaching. Lecture/Class #1 for 2018 to my new cohort of 1st years and one particular student states at the end of the two hours "thank you - you're a fantastic teacher - the best I've ever had." Tomorrow during student practical exercises in our NEVE studio @ RMIT Sound Production we are setting up a comparative recording of Drums with various Ribbon microphones. Results from this will be analysed back at ToKwerX and I'll post the findings and outcomes very soon. Thanx to Mark from OPR for providing "the Grill U-Mod" for this session. The session will include the following "Velocity Transducers:"
Available now in the ToKshop is the first iBook of an intended series on audio engineering. iBook 1 Recording Techniques is a culmination of approaches and an underlying philosophy to recording in the modern era gleaned from over 40 years of recording. I sincerely hope all aspiring engineers find this a valuable resource. Eventide’s Audio division recently released a new entrant into the Transient Shaping collection of digital audio tools available to the modern engineer, although this processor is a lot more than just a means to emphasise the attack transient and shorten the decay elements of a sound. I am loving “Fission.” This is practically splitting the atom when it comes to accessing the elements of the sound envelope and most importantly gives the engineer independent control between both, with a powerful library of dedicated effects assignable to each component: Transient & Tonal. Sure, split a Tom hit and you can alter the balance between the attack strike and the decay of the shell - you can now even Tune the decay independently of the attack with the Pitch algorithm - but this is a sound sculpting tool, not just a Transient Designer of sorts. If you’d like to literally divide the sonic elements that are the DNA of your targeted sound and manipulate them both in beautifully musical (and non-musical) ways then check out “FISSION” by Eventide. This photo from today's festival sums up the integral importance of retaining culture and tradition to guide and educate our next generation in Australia; no matter what creed. A great show with Kutcha Edwards made today special. If you've been following my previous Blogs this month there is clearly a buzz around the new DAW package from HARRISON CONSOLES entitled Mixbus32C. I am extremely pleased to announce that RMIT University's SOUND PRODUCTION program has entered into an education partnership with Harrison, which enables the inclusion of the Mixbus packages into the training collection delivered across the two year Advanced Diploma. Besides allowing the next generation of audio engineers to fully appreciate the differences between DAW software there are also financial benefits made available to current students wishing to purchase the software. All HD studios at RMIT within the Sound Production program will see the installation of Mixbus32C and the Essential plugin bundle over the next few weeks, with audio-focused teaching and learning computer labs already running the packages for compatibility testing. This is a first for RMIT Sound Production, which continues to remain as the premier industry-supported program delivering this form of study. Thank you to the wonderful attitudes to education and the amazing support from Harrison Consoles, Nashville TN, USA. What can I do about it...? If you, like me, think at times that we make no difference to the world, then read on please. The answer in my opinion is to find a way, to actually change the things we know to be wrong, to actually improve the world we are custodians of and will leave for our children and the millions of creatures that share this planet with us. If you happen to believe we do not share this planet then I sincerely ask you to educate yourself further: read, listen, look, be proactive. The next week will be spent commissioning our new SSL room. Frankly we're against the clock on this one, but off to a great start today; the AWS console is up and running!